Ed. by Ralf Ebinghaus, Ralph R. Turner, Luiz D. de Lacerda et al. 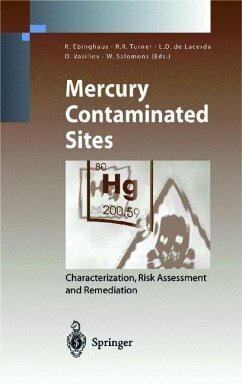 This book presents an up-to-date overview of the characterization, risk assessment and remediation of mercury-contaminated sites. Many industrial activities, including the mining of gold, silver, and mercury itself, have caused mercury contamination of terrestrial and aquatic systems. Unlike other metals, which are generally not very volatile, mercury from contaminated sites can have a significant impact on remote ecosystems via the atmospheric pathway. Thus, mercury contamination is not only a local issue, but also has global dimensions.This book summarizes, for the first time, works from Europe, Russia and the American continent. Review chapters are supplemented by detailed, international case studies. I Reviews.- 1 Natural and Anthropogenic Mercury Sources and Their Impact on the Air-Surface Exchange of Mercury on Regional and Global Scales.- 2 Mercury Mines in Europe: Assessment of Emissions and Environmental Contamination.- 3 Mercury Contamination from New World Gold and Silver Mine Tailings.- 4 Mercury-Contaminated Industrial and Mining Sites in North America: an Overview with Selected Case Studies.- 5 Remediation Techniques for Hg-Contaminated Sites.- 6 Advanced Technology Available for the Abatement of Mercury Pollution in the Metallurgical Industry.- 7 Mercury Contamination of Minamata Bay: Historical Overview and Progress Towards Recovery.- 8 Chemical Interactions Between Mercurial Species and Surface Biomolecules from Structural Components of Some Biological Systems.- II International Case Studies.- 1 Distribution, Bioavailability and Speciation of Mercury in Contaminated Soil and Groundwater of a Former Wood Impregnation Plant.- 2 Relative Importance of Non-Point Sources of Mercury to an Industrialized Coastal System, Sepetiba Bay, SE Brazil.- 3 Monitoring and Assessment of Mercury Pollution in the Vicinity of Electrical Engineering Plants in the CIS.- 4 Mercury in Gas and Oil Deposits.- 1 Atmospheric Mercury in Abandoned Mine Structures and Restored Mine Buildings at Mt. Amiata, Italy.- 2 Mercury in the Town of Idrija (Slovenia) After 50o Years of Mining and Smelting.- 3 Evaluation of Internal Doses of Mercury at Intermittent Exposure to Elemental Mercury at the Mine in Idrija.- 4 Mercury in Terrestrial Food Webs of the Idrija Mining Area.- 5 Vegetation on Contaminated Sites near an Hg Mine and Smelter.- 6 Modern Mercury Contamination from Historic Amalgamation Milling of Silver-Gold Ores in the Carson River, Nevada and Jordan Creek, Idaho: Importance of Speciation Analysis in Understanding the Source, Mobility, and Fate of Polluted Materials.- 7 Gold Mining in Siberia as a Source of Mercury Contamination of the Environment.- 1 Estimation of Gaseous Mercury Emissions in Germany: Inverse Modelling of Source Strengths at the Contaminated Industrial Site BSL Werk Schkopau.- 2 Removal of Mercury from Gases by Modified Zeolites in a Stationary Bed.- 3 Mercury Speciation of MSWI Flue Gas on Pilot and Industrial Scales.- 4 Mercury Saturation Profile Across the Sulphur-Impregnated Activated Carbon Bed.- 1 Basic Study on the Remediation Technology of Mercury Compound-Contaminated Soil by Low-Temperature Thermal Treatment.- 2 Electroleaching: a Mobile Cleanup Process for Mercury Contaminated Materials.- 3 Mercury Decontamination of a Chloralkali Plant in Alexandria, Egypt.- 1 Mercury Subsurface Maxima in Sediments: a Diagnostic for Anthropogenic Origins.- 2 Concentration of Mercury and Other Heavy Metals in Central India.- 3 Fluvial Transports of Mercury Pollution in the III River Basin (Northeastern France): Partitioning into Aqueous Phases, Suspended Matter and Bottom Sediments.- 4 Distribution of Total and Methyl Mercury in a Creek Ecosystem Near Bombay.